Every year, Jeep unveils a slew of wicked concept vehicles for the Easter Jeep Safari. This year, thanks to the 50th anniversary of the Safari and the 75th anniversary of the Jeep brand, the concepts are off-the-charts cool. The flagship must be this monster, above, sporting a 707 Horsepower Hellcat engine! WTF! If you’re in the Moab, Utah area, the Easter Jeep Safari is March 19-27. Thousands of off-road enthusiasts are expected to descend upon Moab for the occasion. 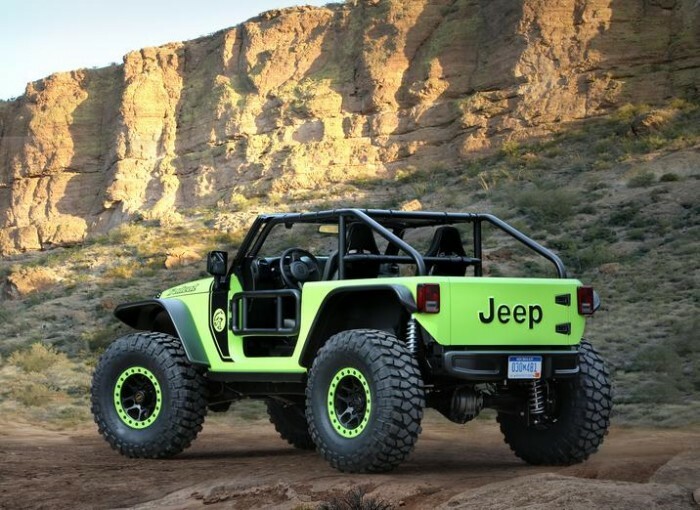 If not, read on to get a glimpse into some very cool concept Jeeps. Named the Jeep Trailcat, the Hellcat-powered off-roader is capable of both crawling and high-speed runs. Called the “ultimate off-road machine” by Jeep, it has a supercharged 6.2-liter HEMI Hellcat V-8 engine mated to a 6-speed manual transmission. Goodness, it has 707 horsepower and you can shift it old-school style, racking a custom embossed Hellcat logo ball as the engine roars! To get the 707-horsepower Hellcat engine into the Trailcat, designers stretched the wheelbase an additional 12 inches. They chopped the windshield two inches for a sleeker look. It also has steel front and rear bumpers, 17-inch beadlock wheels and 39.5-inch BFGoodrich Krawler T/A KX tires, front and rear Dana 60 axles, Fox shocks, and of course, leather seat covers. Or maybe you’d prefer the open bed and rugged looks of the Jeep Crew Chief 715 in all its yummy goodness. 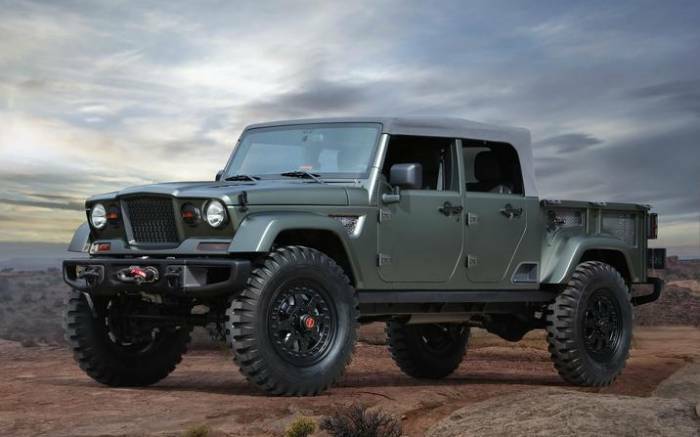 Built as a salute to legendary Jeep military service vehicles, in particular the Kaiser M715, this open-air design is powered by the 3.6-liter Pentastar V-6 engine mated to a five-speed automatic transmission. The Crew Chief 715 utilizes modern-day construction with a rear seat and extra doors, but closely mimics the military classic. Steel front and rear bumpers, 20-inch beadlock wheels and 40-inch NDT military tires pay homage to the original Jeep military vehicles. The Crew Chief 715 has an onboard air system with a hard-mounted quick-disconnect fitting for airing up or lending assistance to other vehicles on the trail. Inside, the no-nonsense interior has leather bucket seats with canvas inserts, aircraft-inspired control switches, and Mopar all-weather mats. It even has a centrally located navigation compass. Old school GPS! Inspired by the classic CJ-5 of the 1950s to handle narrow, winding trails, the Jeep Shortcut is cute in its small-body ruggedness. It’s a tight little package that just begs you to stomp the accelerator and spray dirt skyward. A unique grille, hood, tailgate, front and rear wheel flares, and custom chrome front and rear bumpers, coupled with a modified exhaust, 17-inch red steel wheels, and 35-inch BFGoodrich Mud-Terrain T/A KM2 tires help the Jeep Shortcut maintain the look of an icon. 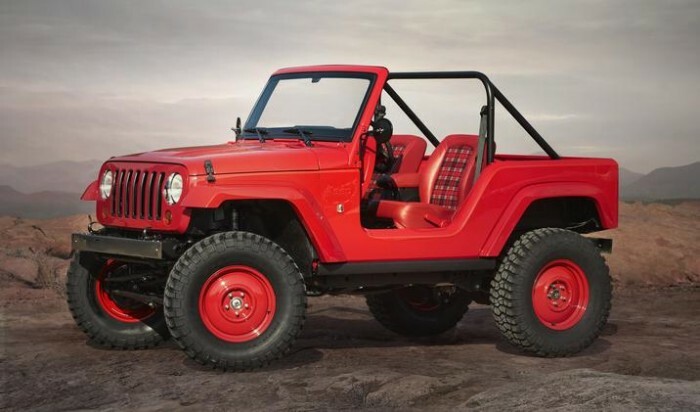 The Jeep Shortcut is powered by the 3.6-liter Pentastar V-6 engine and 5-speed automatic transmission. It gets a performance upgrade from a front and rear Dana 44 axle and a 2-inch lift with Fox shocks. Overall body length has been reduced by 26 inches including bumpers and spare tire to keep the Shortcut concept vehicle light and maneuverable on the trails. 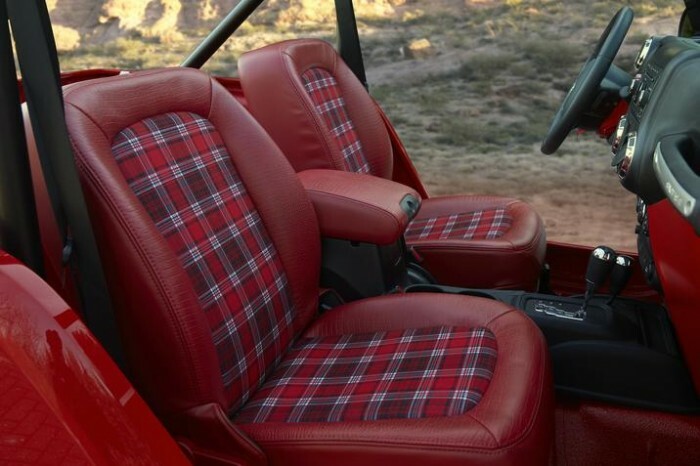 Inside, the simple yet functional interior features low-back leather bucket seats with plaid inserts, a red ball shifter handle, four-point safety cage, and Mopar all-weather mats. You won’t be embarrassed taking the kids to soccer in the Renegade Commander concept vehicle. The ubiquitous Renegade gets upgraded with an assortment of Mopar and Jeep Performance Parts to go from urban grocery-getter to backwoods beast. A 2-inch lift kit and 17-inch Rubicon aluminum wheels with 29.5-inch BFGoodrich All-Terrain T/A KO2 tires boost its off-road capabilities. 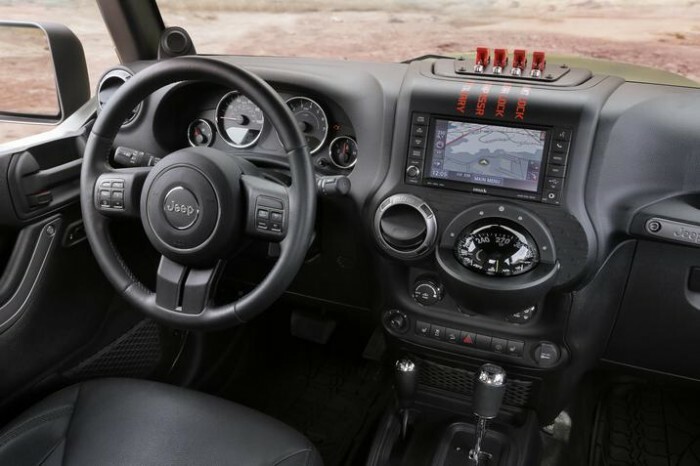 Inside, the Renegade Commander includes Katzkin seat covers, body-color bezel accents, a pedal kit, Mopar off-road kit, and Mopar all-weather floor mats. 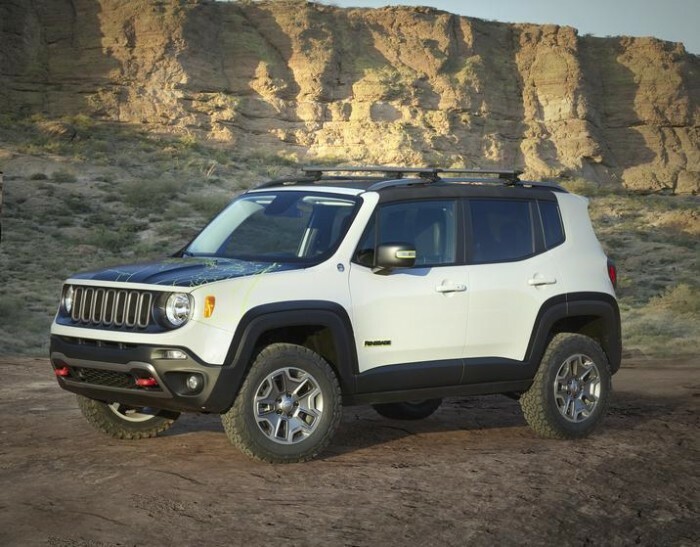 The Jeep Renegade Commander is powered by the 2.4-liter Tigershark engine with MultiAir2 mated to a 9-speed automatic transmission with Jeep Active Drive Low. Is it a Jeep? Or is it a pickup? 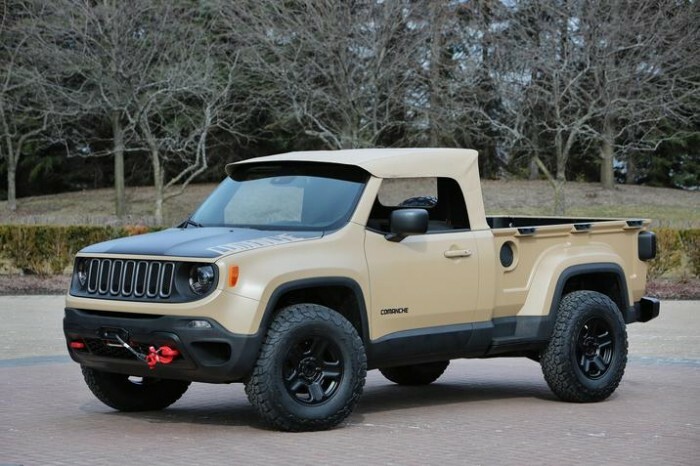 Based on the Renegade, the Comanche concept vehicle gives a nod to Jeep pickup trucks of years past. Could there be a future Jeep pickup in the works? Come on Jeep, quit teasing us! A six-inch wheelbase stretch accommodates the Comanche’s 5-foot bed, while inside, custom seat covers, pedal covers, door sill guards, and Mopar all-weather mats set this Jeep apart. A 2-inch lift kit and a winch bolster the Comanche’s off-road capability, rolling on 16-inch painted wheels and 32-inch BFGoodrich All Terrain T/A tires. And it’s a diesel! Its heart is a 2.0-liter diesel I-4 engine mated to a 9-speed automatic transmission with Jeep Active Drive Lock, which includes low range and a locking rear differential. 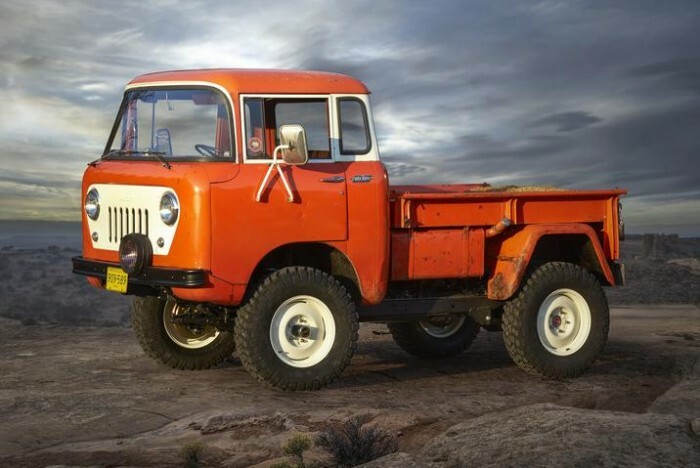 This 1960 Jeep FC 150 concept vehicle just oozes history. Built to tackle rocky trails while getting the job done on western cattle ranches from 1956 to 1965, the FC 150 is based on the CJ-5 and offers a clever packaging solution by keeping overall length to a minimum for maneuverability, but maintaining a full-length cargo box for utility. This one-off has the original steel body, still proudly bearing battle scars. The components underneath have been revamped, its off-road prowess enhanced with a 2005 Jeep Wrangler chassis modified to accept a Dana 44 front axle, Dana 60 rear axle, and 17-inch white steel wheels wrapped in 33-inch BFGoodrich Mud-Terrain T/A KM2 tires. It’s powered by a torquey 4.0-liter PowerTech I-6 mated to a 3-speed automatic transmission. This bad boy will get you off the beaten path, with extra room for gear and fuel tanks. Based on the Wrangler Unlimited, it has enhanced off-road performance and aggressive looks. 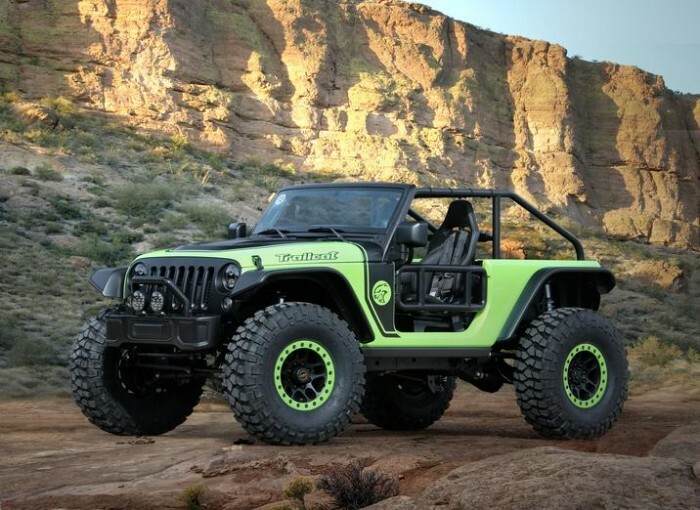 To juice its off-road cred, it has 17-inch concept off-road wheels wrapped in 37-inch tires, a 2-inch lift kit with Jeep Performance Parts/Fox shocks, a Rubicon winch, and Dana 44 front and rear axles. Half doors offer a clear view of obstacles ahead and a bedlined interior allows you to hose down the inside after a rowdy day in the mud. Mopar exterior enhancements include a winch guard, Satin Black grille, LED headlights and fog lights, high top fenders, power-dome vented hood, Mopar off-road rock rails with a step, Big Brake Kit, a concept fast-back soft top, tail light guards, and a Mopar fuel filler door. Finishing the Trailstorm’s exterior upgrades are a steel front and rear Rubicon bumper. 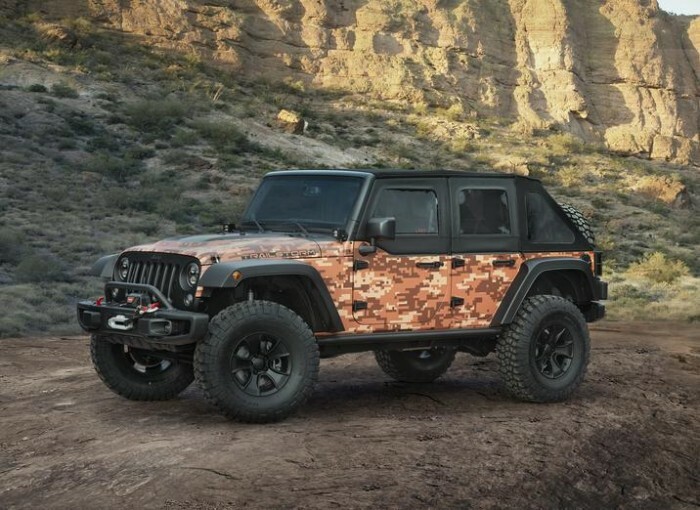 This camo beast is powered by a 3.6-liter Pentastar V-6 engine with 5-speed automatic transmission.